Could you briefly outline your areas of expertise and artistic practice? My expertise is in the painting materials and techniques used by artists between the 13th and 18th centuries, and their close alliance to the Hermetic tradition as an expression of metaphysical philosophy. What appealed to you about the Dunhuang exchange project? 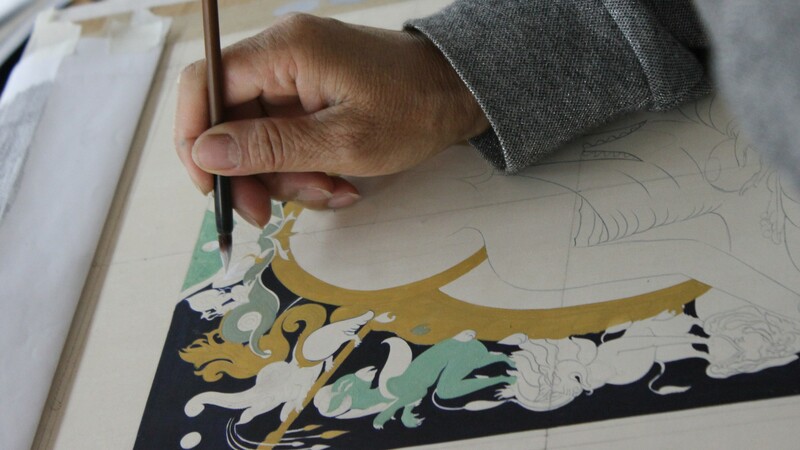 The opportunity to work with professional artists, sharing our knowledge and creative experience, and being able to give the Dunhuang artists practical experience in a craft philosophy that has its roots in cosmology and the alchemical tradition; showing how the craft practices function as a doorway into the inner world. What were your expectations of visiting the caves? A deepening connection with a traditional wisdom that lies within all of us, but which modern technology is destroying through its one-sided preoccupation with material profit. Were there any ways the visit exceeded your expectations? Seeing the deep beauty exhibited in the cave paintings as well as the remarkable expertise of the Dunhuang artists. Their understanding of technique excels anything I have seen in the west, with a freshness and vitality that is so badly needed in the art world. Seeing these artists work shows so clearly what we have lost in the west in our art education, which has abandoned any training in technique, to the point that painting and drawing are now being eliminated from the fine art curriculum within art colleges and universities in the UK. What skills and knowledge do you feel you were able to contribute over the course of your visit? I was able to teach the Dunhuang artists how to prepare their pigments from nature using plants, rocks, earth and bones, following traditional practices from the past two thousand years. They were shown how to make a traditional gesso panel from animal skin glue and chalk; this is built up in ten layers and then sanded to create a fine ivory-like surface on which to paint. Students were also taught about egg tempera; how the egg is prepared for use in painting and mixed with the pigments to make one of the finest and most beautiful mediums in the history of western art. The painting is first constructed in translucent tones in one colour, over which are applied glazes of pure colour that interact with the tones beneath. This was the basis of chiaroscuro, which was developed by such artists as Rembrandt and Caravaggio. What were some of the findings you made that you expect to further your own practice? The use of the traditional Chinese brush, which is so versatile, and has such a range of marks and a sensitivity I would never have thought possible. Though technology is rapidly changing China and destroying its traditional skills, the people are still much closer to their traditional knowledge than we are in the west. This is expressed not just in their extraordinary painting skills, but also in their brushes, pigments and mediums. I have never seen such beautiful cinnabar; their malachite, azurite and chrysocolla are of superb quality, and their natural earth colours are exquisite. Were there any different working practices that intrigued you? The Dunhuang artists were able to express a flow and vitality in their brush stroke that is really masterly, transmitting such a deep beauty. What other outstanding memories do you have of the visit? Visiting China and talking with the people, experiencing some of its culture, evoked in me an appreciation for its rich cultural inheritance. Within the society was a deep awareness and respect for others, based on humility. This feeling of humility surprised me, and at the same time resonated deeply with my own experience of traditional society. I’ve always been inspired by Taoism and the writings of Lao Tzu, and how these teachings permeate into the crafts and culture. I felt one only needed to scratch the surface to be awakened to teachings of China’s great spiritual masters.